AMBS Architects, founded by Iraqi architect Ali Moussawi, designed a 230 storey (1,152-metre-tall) building in Al Basra, Iraaq. The plan is to have the Bride Tower as the highest building and the first vertical city in the world increasing the city’s capacity by 2025. Composed of four conjoined towers, The Bride tower’s 230 storeys would be topped by an 188-metre-tall antenna. 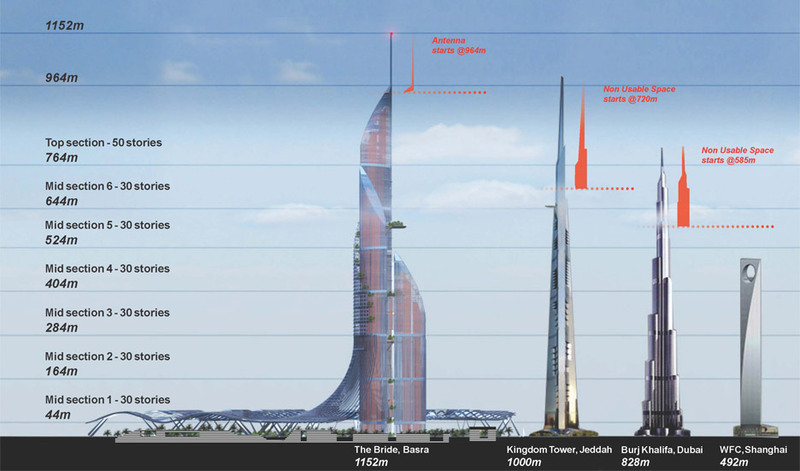 The tower will be 152 metres higher than the planned height of the Kingdom Tower, in Saudi Arabia. 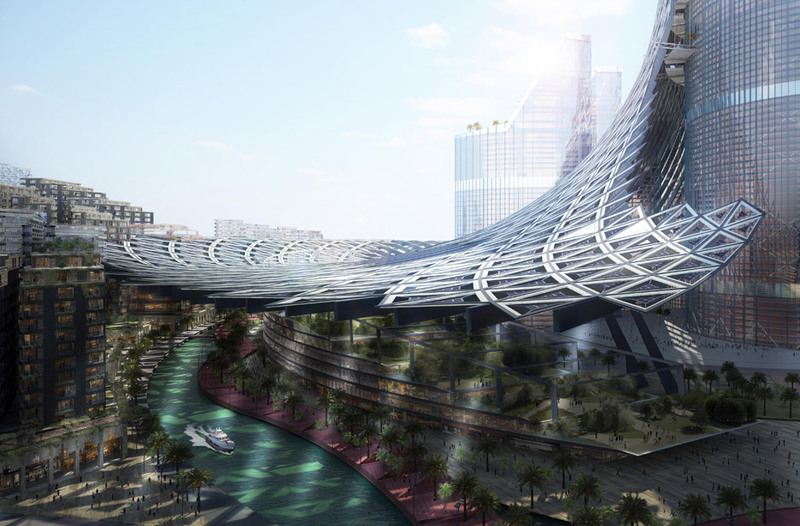 The proposed building has been named “The Bride” after “the bride of gulf”, a local reference to the fertile land surrounding Basra. Comprising four towers, the structure would house supermarkets, a school, a sky garden, commercial centre and residential neighbourhoods. AMBS Architects has offices in London and Baghdad, and is also behind the design of the first public library to be built in Iraq since the 1970s. 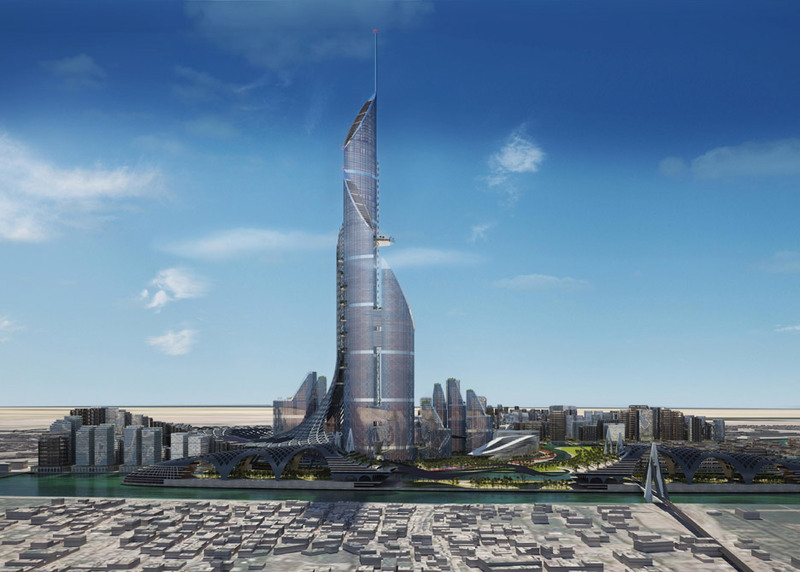 The firm described its skyscraper as “the first vertical city in the world”, saying it will not only be the tallest structure but will break new ground in engineering and vertical transportation. “In contrast to a conventional tower, The Bride will be a place that may be enjoyed by all, not only for the ones that live and work there, but also the rest of the public,” the firm said in a statement. The Bride is planned to be a net-zero structure – meaning it would produce as much energy as it consumes. No start date for construction has been set.